Amazing what the new beginner wings can do today. Yeahhh, Penny’s new Ion2 finally arrived and she flew it last Sunday with a big grin in her face. Even this eagle (behind her) had to fly with her to believe what he saw. We are very excited about the whole development Nova is focusing on. Last October the kids, Penny and I had the pleasure to be at the last Nova-Pilots meet at Fiss in Austria. It was a fantastic place and we all enjoyed the area, people and the great service we had. Katia and I lucked out to win the first prize (weekend in Fiss) by kicking the soccer ball into goal at our landing, see the pictures below. Anyhow, a lot of people were surprised when Hannes announced during the meet that they are working on a new Low 1-2 wing (Ion2) instead of a new high end wing (Triton2). Hannes stated that the 2-3 wings are going through a lot of changes and he is more excited to show what you can do today with a low end 1-2 wing. A couple month later, the result of the Ion2 (low end 1-2 wing) was enormous, the performance and handling in this class is outstanding. All the words and hype got now backed up with a 223 km FAI triangle flight last week. No one ever flew on a wings you can use to teach people on this far. Now to top it off, Nova released the new Prion2, which is a beginner wing which is used mostly in schools. Well, this wing is not only for schools, it has just about the same performance like the Ion2, which means you should be able to do a 200 km flight as well. The very interesting result of this, is how students are now looking at buying wings. 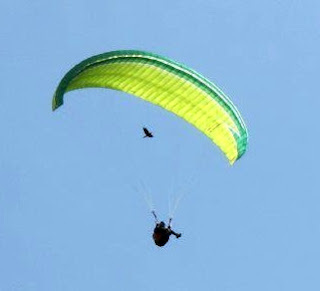 I was running a beginner to novice paragliding course the last 10 days and normally people are looking for cheap used wings to get started and once they have a couple hours under their belt to upgrade to a 1-2 wing and then start with cross country flights. This approach is now changing as you can skip the first step and get stated right away with a wing which is save to learn on with a great handling and the performance to fly far and long from the get go. Well done and thanks to Hannes and his team.